In a wide bowl, add flour salt and mix well and using water make a soft and smooth dough. Knead the dough for 3-4 minutes and cover the dough with damp cloth for 20-30 minutes. After that divide the dough into 6 equal portion and make a round lemon sized balls with it. Take a ball, toss it on the flour and roll out into thin circle of 7-8 inch diameter. As you roll them out, keep tossing the disc on flour as this will prevent it from getting sticky when rolling them out. Repeat with all the dough and start cooking phulka. Heat a tawa/griddle, keep the heat in medium high. Once the tawa is hot, place a rolled disc and cook for 30-40 seconds or until noticing small air bubbles. Then flip other side and cook for another 30-35 seconds, now take the cooked roti off the tawa and keep the first cooked side on the direct flame. It should immediately puff up into balloon, once it puffed up remove from the flame and keep it on hot pack. 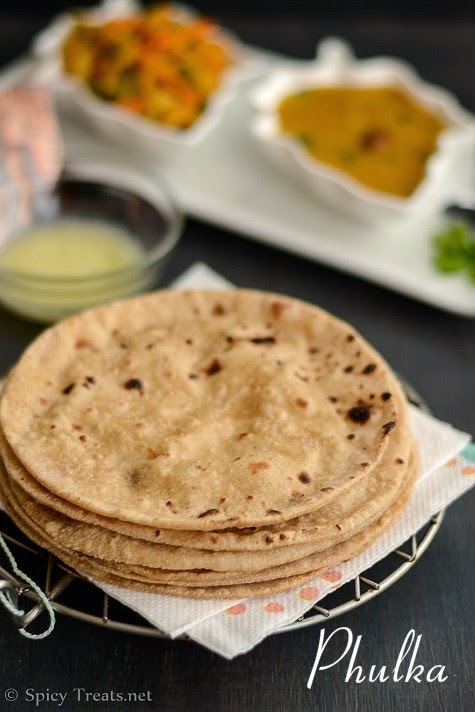 If desired, smear ghee or oil on the top of the rotis and keep it covered wit paper towel. 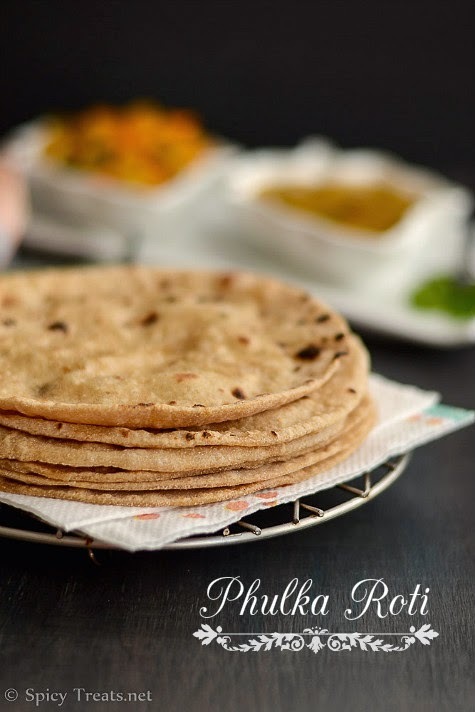 Thats it...No fat/Zero Oil Phulka rotis ready and serve with any desired accompaniment. 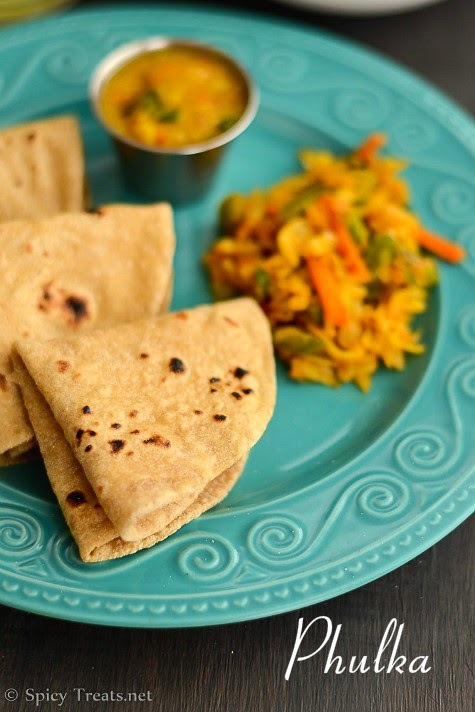 We had it with Dal Fry & Cabbage Capsicum Curry. *water - the water quantity depends on the flour type. So adjust accordingly. But make sure your dough is loose and soft. Do not keep it in flame for long time, the rotis will burnt and turn hard. Also make sure, you roll the dough without any tear and dust it as needed. I usually dip the disc on flour and roll them, this way the disc will not stick to the surface and easy to roll. so there will not be any tear on the rolled dough.Keep the rotis covered, as the phulka tend to dry when it left uncovered. Smear with butter or ghee if desired. Resting time is more important, i rest the dough for minimum 30 minutes and sometimes even 40-45 minutes. You can also make the dough using food processor or stand mixer. You can also puff up rotis in coil stove by using wired rack. While cooking on directly flame, keep the heat to high or full flame. Yeah...making phulka is an entertainment too ;) Glad you liked my video..a small try :) Thank you so much.. 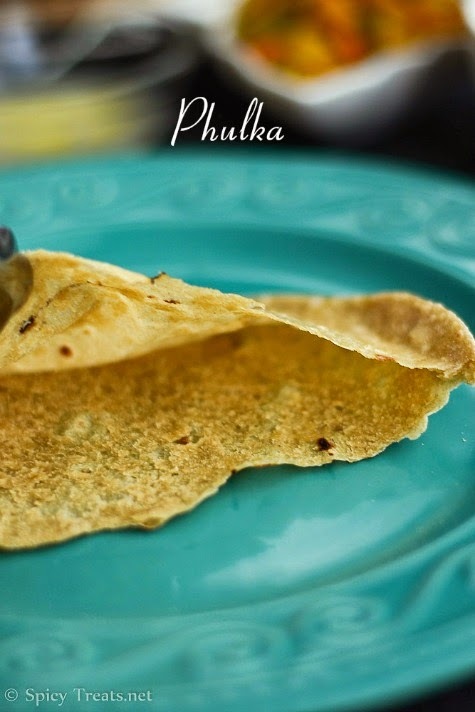 Perfect puffed phulkas.Loved the video too. Superb clicks. Nice useful post with good tips, thanks for sharing. lovely way of showing this...looks soft..